Some African cocoa farmers have never eaten chocolate even though the continent supplies more than half of the world’s cocoa. Cocoa is a commodity, one of the world’s most volatile, and the quality of the farmers’ lives rise and fall with the cocoa prices. The money isn’t in the growing of cocoa, but in the processing of the cocoa into chocolate, the packaging, and the selling of the chocolate. This typically happens far from African soil. Hence you have cocoa farmers who’ve never tasted chocolate, and others like the ones I ate Hershey’s Kisses with in Ivory Coast who rarely do. Harper is totally going to need therapy! I’ve never known someone who died from ALS, nor was I fully aware of how scary the disease was until the challenge. So as silly as this challenge seems, it raised my awareness. And of course, I hope you’ll join Harper and me in donating to the ALS Association at www.alsa.org…. Have we met? Here’s my speaking schedule (as of 8/13). If I’m at a city near you, let’s grab a coffee or beer or come hear me speak. I’ll bring the novelty underwear and the banana. Wait? That doesn’t sound good. I mean that in the least sexual way as possible. Tim McCollum, a former Peace Corps volunteer, is the CEO of Madecasse, a Brooklyn-based chocolate company that sources cocoa and manufacturers chocolate entirely in Madagascar. Tim joins me LIVE on Google Hangouts to discuss the African cocoa industry’s challenges and potential. Join us! Ask a question! I’ve carried a lot of stories over the past twelve years I’ve been writing, but few have been as heavy as those stories from Ireland. They have been even heavier because the book never came into existence, and I’m not sure where you publish such stories. So for the first time, I’m sharing them on this blog and on the blog of the Facing Project. Review WHERE AM I EATING and get goodies! Would you help share the stories of the farmers and fishermen who catch pick and grow our food? What if there was bacon and chocolate on the line? That’s right…BACON, chocolate, and some other goodies. 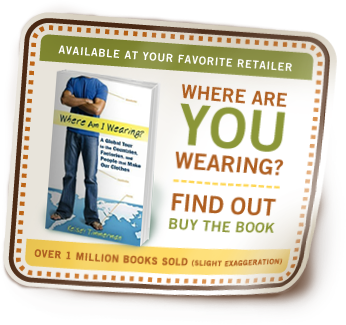 The paperback of WHERE AM I EATING? is coming out in about one month. I’m pumped for the stories of the farmers I met on my global farming adventure to spread even more. About 80% of the folks who read my first book, read the paperback. So a big push on the the paperback is really important. Supermarkets checkout lines are filled with magazine covers of photoshopped, liposucked, and unnaturally enhanced specimens of biology and reality. But the unrealistic expectations in our supermarkets don’t end there. We like ’em big, round, smooth, and shiny. And of course now I’m talking about fruits and vegetables. Forty percent of food in the United States goes uneaten. This includes ugly fruits and lumpy vegetables. The cost to transporting food to our tables accounts for 10 percent of the U.S. energy budget, uses half of our land and 80 percent of the freshwater consumed. Yet, if a potato has an extra lump or an orange a strange phalange, they get tossed without a second thought. Cocoa Farmers Who’ve Never Tasted Chocolate – GASP! Like the reporter in the video, I traveled to Ivory Coast to meet farmers and lugged along some chocolate. I assumed they had never eaten chocolate too and that I would blow their taste buds with Hershey bars and Hershey kisses.